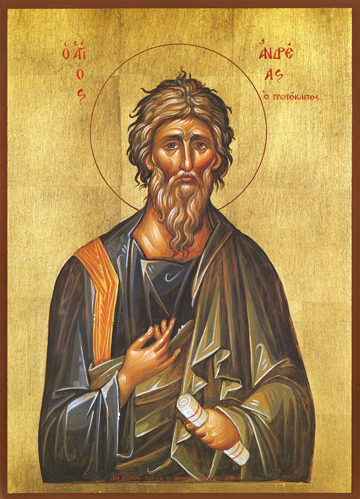 St. Andrew is referred to as the “First-Called” of the Disciples. Before this calling, he was one of St. John the Baptist’s disciples, but when he heard St. John proclaim that Jesus is “The Lamb of God,” he immediately left St. John to follow Christ. St. Andrew was a fisherman with Simon, his brother, and they were partners with Zebedee and his two sons, James and John. St. Andrew brought his brother Simon to meet Jesus, and later Christ renamed Simon the “rock,” or Cephas (in Aramaic) or Petros (in Latin), so we know him as Peter. St. Andrew preached the Gospel in Byzantium, the Balkans, Carpathia, Russia, and finally in Greece and the Peloponnese. In Kiev he erected a cross and prophesied a Christian future for that land; he is therefore regarded as the Apostle of Russia. In Patras of the Peloponnese he converted many pagans to the Christian Faith, including the Imperial Governor’s wife and brother. This brought the Governor’s wrath upon St. Andrew, and he was crucified on an X-shaped cross, from which he preached to the people for several days before going to his Lord in the year 62.